I can't tell you how many times I've hosted Libby Fischer Hellmann at a library, or heard her speak at other venues. She's written a guest post about libraries for this blog. But, I've never actually interviewed her. It's time. Libby has a new Georgia Davis mystery, High Crimes, so it's a perfect time to talk with her. Thanks, Libby, for answering questions. Libby, As long as we’ve known each other, I’ve never done a Q&A with you. You’ve written for the blog, but it’s been a few years. Would you reintroduce yourself to readers? Hi, Lesa and her readers. I’ve known Lesa for at least 10-15 years when she was still in Arizona. Not sure how we avoided doing an interview, but I’m thrilled we’re doing one now. Short version: I am an award-winning Chicago crime thriller author, and HIGH CRIMES is my 15th novel. I’ve also written about 25 short stories and novellas. I used to work in broadcast news, and then public relations, and I grew up in Washington DC many years ago. I was the National President of Sisters in Crime ten years ago, and I interview other authors on a streaming TV show called SOLVED!. Please introduce us to Georgia Davis. I write two series (as well as historical thrillers). Chicago PI Georgia Davis, a former cop, is the protagonist of one series. HIGH CRIMES is #5 in the series. When you first meet Georgia in EASY INNOCENCE, the 1st in the series, you’ll find she’s a loner. She’s recovering from a love affair gone bad, she has baggage, and she doesn’t trust easily. While my other protagonist, video producer Ellie Foreman, will go to lunch with you and give you TMI about herself, Georgia won’t go out to lunch with you at all. However, over the five books, Georgia slowly undergoes changes in her life, which I won’t ruin for you here. Above all, Georgia has a finely tuned sense of justice, and she’s not afraid of threats or bruises. One caveat: the books are dark, sometimes hard-boiled. Definitely not cozy. Tell us about High Crimes, without spoilers. It’s fourteen months after the 2016 election and a robust Resistance movement has targeted the man who assumed the Presidency. At a demonstration in Grant Park, the leader of a Resistance FB group is assassinated. The gunman dies in an explosion shortly afterwards. The family of the dead girl asks Georgia to investigate after they receive an anonymous email questioning the gunman’s “guilt.” Her investigation takes her from Chicago, to Washington DC, to a Minnesota lake and back. At the same time Georgia’s mother, who abandoned her when Georgia was young, returns to Chicago, and Georgia must confront all her unresolved family issues. Rage. Not about conservative policies—in fact, I’ve become more conservative as I age—but about the man who now occupies the Oval Office and what I believe is the fraudulent way he was elected. I couldn’t write, I couldn’t concentrate, I couldn’t do much of anything except read and vent. (I lost FB friends because of it). I also joined a FB group whose founder and members felt similarly. After about a year, I realized I was giving him way too much power over me, and I began to think about writing again. It was one night when I was reading the posts from the FB group that the idea came to me: What if the founder of an Anti-Trump FB group was murdered? I knew immediately from the spark in my gut that THIS WAS THE STORY I HAD TO WRITE. So I did. Everyone has different publishing stories, and I know yours has changed over the years. Would you tell us about your publishing journey? In a word – it’s been a roller coaster. I started out at Berkeley Prime Crime with my Ellie Foreman series. Those novels were simultaneously published in hard cover by Poisoned Pen Press. Then I moved to Bleak House for the first 2 Georgia novels. Then to Allium Press of Chicago for 2 historical stand-alones, then back to Poisoned Pen for a fifth Ellie book. Along the way, I also wrote several indie thrillers, filling in the Georgia series and publishing a collection of my short stories. So I’m now a hybrid author. Which has been fun (I’m a Type A personality)… but it’s also a lot of work. The advantage is that I know a lot about publishing. Which should have made me a genius, except that the industry is constantly changing, so just when I think I have it down, everything turns inside-out, and I need to start over. Hopefully, that means I’m a survivor. I think. Would you tell us about “Second Sunday Crime”? That show is on hiatus because I’m now doing a streaming TV interview show for the Author’s Voice network. My show is SOLVED! and I interview crime fiction authors, both local and national. The only requirement is that they need to be in Chicago when we do the interview. We broadcast on Facebook Live, then the recording stays up on FB. It also migrates to YouTube. It’s allowed Author’s Voice to vastly expand its audience, and people seem to like the shows. I’m finishing up my second year with them. They operate out of the Abraham Lincoln Bookshop in Chicago, which, speaking of Chicago sights, is a fascinating place to visit. I have a personal question. Where do you like to take people when they come to visit Chicago? Great question, Lesa! Beyond the typical sites like Sears Tower, Millennium Park, the Art Museum, and a boat tour on Lake Michigan or the Chicago River, I would go to the Museum of Science and Industry. Then we’d get deep dish pizza at Uno’s. Then we’d go to a Blues joint, like Buddy Guy’s Legends. The next day we’d go to the Bahai Temple in Wilmette and the Botanic Gardens in Glencoe. They’re both magnificent settings. There are so many it’s hard to narrow them down. I’m more partial to modern authors, so Sara Paretsky, Val McDermid, Tess Gerritsen, and Karin Slaughter would be in the first tier. 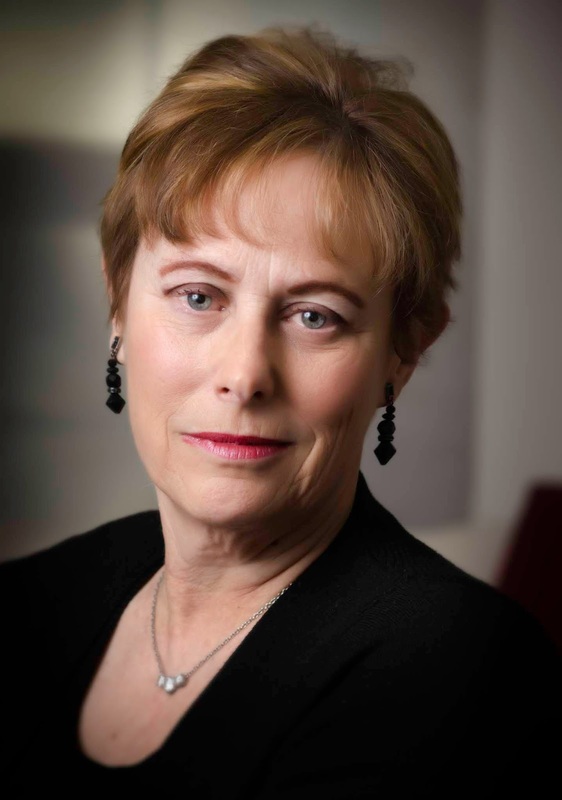 More literary writers like Jodi Picoult, Kate Atkinson, and Kristin Hannah as well. If I could spend a year just reading, I’d be in heaven. What author or book do you think is underappreciated? Jeremiah Healy, who is no longer with us, wrote a fabulous series with a Boston PI, Cuddy. I loved that series and wish it was ongoing. THE STAKED GOAT was especially good. Libby, what’s next in the pipeline for you? Interesting question. I’m not sure. I’m thinking about a new Ellie Foreman mystery (that’s my other series for your readers who don’t know)… BUT… I’m going to Vietnam and Cambodia next March. Since I was alive, and more important, sentient during the Vietnam war, I may have to write a historical novel set largely in Vietnam during the war. We’ll see. 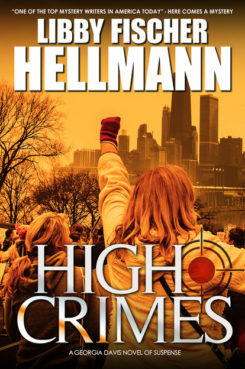 High Crimes by Libby Fischer Hellmann. The Red Herrings, 2018. ISBN 9781938733956 (paperback), 329p. Thank you, Kay. As we said, I've known Libby for quite a number of years, but we never did an interview. I'm glad you enjoyed it! I read her first couple (Ellie Forman) years ago, and have several more on my Kindle. I think I need to try this series. Time for me to get started with this author. Thanks. as I also loved Jeremiah Healy,. You're welcome, everyone. My pleasure!